The Running Professor: What’s the Scoop on the 2018 Club Grand Prix Contests Heading into the Final Event at Tulsa? What’s the Scoop on the 2018 Club Grand Prix Contests Heading into the Final Event at Tulsa? October 11 2018. The Masters 15K Championship at the Tulsa Federal Credit Union Tulsa Run on Saturday October 27th is the final event of the 2018 Masters Grand Prix. Some divisions are already locked up as far as the winner is concerned but most divisions have some contests still up in the air. It can get complicated; let’s see what’s what! Note: I will refer to the 2018 Championship events by distance or by XC designation-1 Mile (Flint), 5K (Atlanta), 8K (Virginia Beach), 10K (Dedham), 15K (Tulsa), Half Marathon (Ann Arbor), Club XC (Lexington KY), XC Nationals (Tallahassee), 5Km XC (Buffalo). Underneath each narrative, I list three teams in italics. If the team has the place locked up, they are also in bold; if not, it is my best guess as to the likely team to finish in that spot. Club Grand Prix. Teams compete in ten-year age divisions 40+, 50+, and so on. Any person over the age of 49, including folks in their 60’s and on up may compete in the 50+ division but no one under the age of 50 may do so and the same rule applies to other divisions. The point assignment in the Club Grand Prix for each race is 100-90-80-70-60 for 1st through 5th and then to 55 and then continuing to fall by 5 points for each place after that. Three races is the minimum required to earn an award; the cumulative scores over the best 5 events becomes the total score. High points win. A tie for 1st place may be resolved by tie-breaking rules. Tie-breakers are 1st—head-to-head competition; and 2nd highest number of team wins. For 1st and 2nd, if a tie cannot be resolved, duplicate banners and certificates will be awarded and the prize money split equally. Ties between 2nd and 3rd place teams will not be broken; they split the prize money and both get certificates showing 2nd place. The tie-breaking rules are applied only to break a tie for 1st place. Before the race. How many teams will Atlanta and GVH send to Tulsa? Both have Women’s teams from the 40+, 50+ and 60+ divisions that are in contention for a Club Grand Prix Podium Award. Their Men’s 70+ teams are also contending for 2nd and 3rd in Men’s 70+, with Atlanta trying to hold onto 3rd in Men’s 50+ and GVH trying to hold onto 3rd in Men’s 40+. 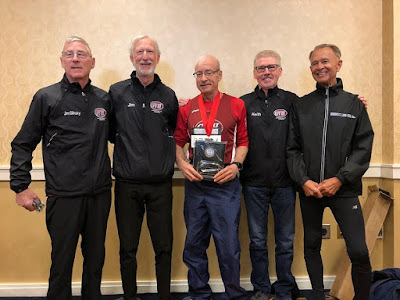 If Atlanta does not send a Men’s 50+ team and Cal Coast is able to field a team, it is likely that Cal Coast will replace Atlanta in 3rd in the Club GP. Once the teams are settled and the race starts. Unless the B.A.A. 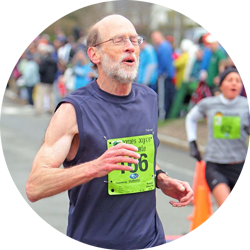 or the Central Mass Striders send a team to contest the 15K, there is little drama to the Men’s 40+ race. If so, then to stay in 3rd place, GVH would have to run and keep those teams from finishing too far in front of them. Assuming there is an Atlanta team in M50+, can Cal Coast finish 4 places ahead of Atlanta and take their 3rd place in the GP? Assuming there is a GVH M60+ team, can Cal Coast finish at least two places higher than GVH to tie GVH for 4th, or 3 places higher to take 4th and drop GVH to 5th? Assuming there is a GVH M70+ team, can GVH beat Ann Arbor and wrest the GP title from them? Failing that can they beat Atlanta to hold on for 2nd place in the division? Assuming both Atlanta and GVH show up for Women’s 40+, can Atlanta manage to finish 4 places higher than GVH? It would be a tall order. Assuming both Atlanta and GVH show up for the W50+ team contest, Atlanta needs to finish 4th or higher and beat or tie GVH to either tie for 2nd in the GP or replace GVH in 2nd. GVH can retain 2nd place in the GP by beating Atlanta. In the W60+ race, all the GP drama is in who will field a team. If all 3 are in and finish the race, then the final GP order should be Atlanta, GVH, Red Lizard. If GVH sends no team, Red Lizard will move up to 2nd place and GVH drops to 3rd. If Atlanta sends no team either, Red Lizard can move all the way to 1st in the GP. Men 40+ The Garden State Track Club New Balance has this one locked up. Their wins at XC Nationals, the 8K, HM, and 1 Mile, combined with their 3rd place finish at the 10K to give them 480 points. The Atlanta Track Club has 430 points on a win at the 5K, 2nd place finishes at XC Nationals and the HM, a third at the 8K and 70 points for their 4th place at the 10K. That means even if Atlanta would win the 15K, they would not get the full benefit of the 100 points they earn. The 100 would replace the 70 and raise their 5-event total by only 30 points. Their maximum potential is therefore 480 but Garden State would win the tie-breaker based on going into the 15K with a head-to-head advantage of 4-0. Atlanta has 2nd place locked up as well. The Genesee Valley Harriers (GVH) has 245 points and so cannot catch Atlanta. In principle the current 4th and 5th place teams, the Boston Athletic Association and the Central Mass Striders, could catch GVH but it is unlikely for two reasons: first, they would have to beat GVH by at least 65 points; and second neither team has competed in the five years the 15K Championship has been in Tulsa. The Willow Street Athletic Club is in 6th with 140 points on to events. If Willow Street competes as a team at the 15K, they would have the minimum requirement and would take 4th if neither the BAA nor Central Mass contests it. The Greater Springfield Harriers [GSH] have 500 points and cannot be caught. GVH has 450 points and cannot be caught for 2nd place. Atlanta TC has 305 points but can be caught for 3rd. Cal Coast is only 40 points back but if both contested the 15K it would be tough for Cal Coast to finish 4 places ahead of Atlanta. 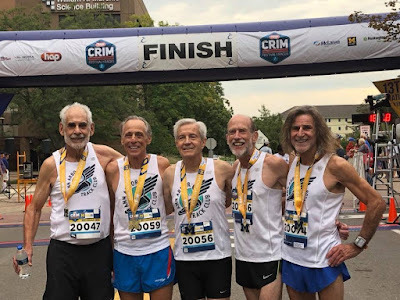 Furthermore, none of the Cal Coast 50+ guys are entered yet at Tulsa; they have not competed as a team since the 5K in mid-August and did not field a strong enough team to defeat Atlanta there in the 5K. We all expect GSH to win but nothing is guaranteed. Right now, only 3 of GSH’s runners are entered. With 3 runners, if even one runs into some trouble or a family event conflict arises, they may not come, as GSH does not need the points to take the Club GP win. Even if Cal Coast should decide not to challenge, the Playmaker Elite New Balance team could. They are 100 points behind. If GSH does not field (and finish) a complete team for any reason, and if neither Atlanta TC nor Cal Coast TC were to field teams, a Playmakers Elite team could tie Atlanta. If they won they would rise from 205 to 305, to tie Atlanta on points. Ties below 1st place are not broken. It is a long shot but not impossible. I have heard that some of the Cal Coast guys will be in Tulsa but not sure which ones or how strong a 50+ team they will field. 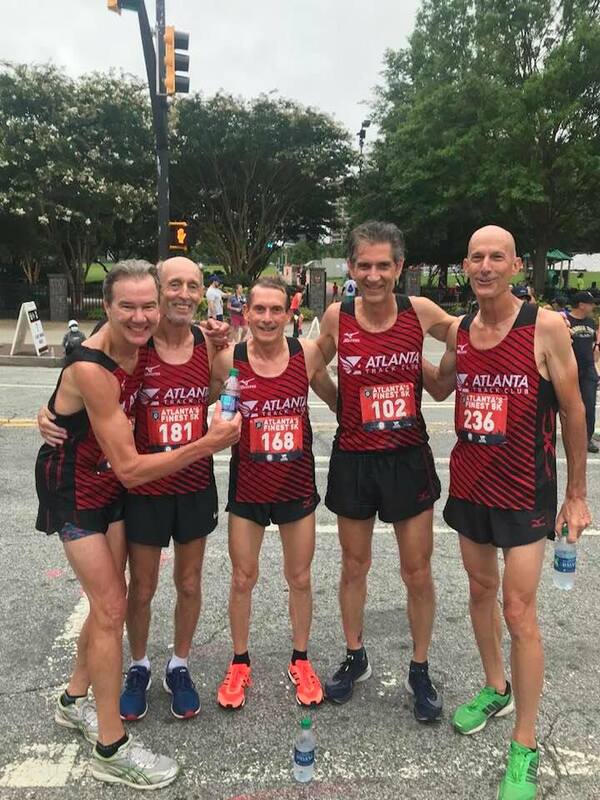 The Atlanta Track Club let the World know that they clinched the Masters Grand Prix in their home town race, the 5K in August. 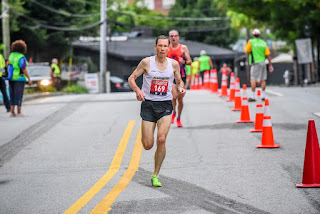 Heading into the 15K, Atlanta is only 20 points ahead of the Boulder Road Runners, 490 to 470. But only the top 5 scores count and Boulder currently has 5 scores at or above 90 points; their maximum improvement if they win the 15K is to 480 which leaves them ten points behind in 2nd place. It is similar with Boulder and the Shore Athletic Club. Shore is only 40 points behind Boulder but they can only improve by 20 points by winning the 15K. Boulder has 2nd place locked up. Despite that, Boulder will bring a strong team to the 15K and are looking to end the 2018 GP season with a Championship win. GVH, in 4th with 365 points cannot catch Shore but GVH might be caught by Cal Coast, 20 points back, or Ann Arbor TC, 35 points back. Cal Coast’s team is in for the 15K but neither Ann Arbor nor GVH have yet to be heard from. GVH has not sent a Men’s 60+ team to Tulsa since 2015. If GVH does not contest the 15K, Cal Coast will almost surely move ahead in the GP standings. If GVH contests the 15K, Cal Coast needs to finish 3 places higher to move ahead and 2 places higher to tie, because ties below 1st place are not broken. Although some of the GVH runners congratulated some of the Ann Arbor Track Club runners on sewing up the GP Championship after the 5Km XC, it is not true on paper. Ann Arbor has 490 points going into the 15K, only 20 points ahead of GVH. If GVH won the 15K and Ann Arbor finished 3rd or lower, GVH would tie on points and would, at that point, have the tie-breaker 3-2. What about the Atlanta Track Club? They are only 10 points behind GVH. They cannot beat Ann Arbor because their maximum improvement from winning the 15K would only be 10 points, but that would be enough to tie GVH and force a split of the 2nd and 3rd place prize money. Ann Arbor and Atlanta both have full teams signed up for the 15K but GVH has not shown their hand. GVH may feel that Ann Arbor has a good chance of beating Atlanta in the 15K and that is all they need to retain 2nd in the GP. Had the Boulder Road Runners not lost one of their best to an injury in Virginia Beach, they would likely have been in the thick of this division battle as well. The Atlanta Track Club, the Genesee Valley Harriers, and the Impala Racing team are all still in the hunt. GVH is in the driver’s seat with 430 points, followed by Atlanta at 390 and Impala 350. No one else can catch these three teams. If GVH contests the event, they have a good shot at retaining 1st place. Atlanta would have to finish 4 places higher than GVH to tie them on points. Atlanta has the tie-breaker. If GVH contests the event it would be almost impossible for Impala to catch them. A wrinkle that might make it possible is that LRC Racing out of Lincoln Nebraska will send a strong W40+ team again this year. 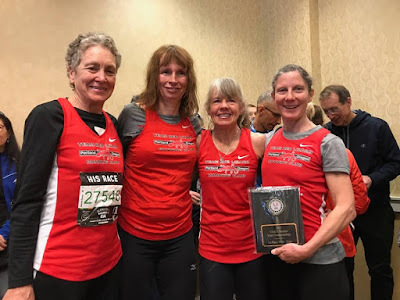 Last year their top 3 runners came in 3rd, 6th and 9th overall on the Women’s side in times ranging from 59:59 to 1:03:56 on that tough hilly course. They are bringing 3 more runners this year. That may make it tough for any of the 3 contenders for the GP podium to score 100 points in Tulsa. If GVH sends a team and Atlanta sends a team, it may be possible that a strong team from Atlanta could win and there could be 4 teams finishing between them and GVH. But it will likely take a strong team to beat LRC. If all three teams contest the event, it is most likely that the current order stands, GVH, Atlanta, Impala. If only GVH stays home, most likely the title would go to Atlanta with Impala taking 2nd. History of contesting the 15K is no help in sorting things out as none of these three teams have competed in the 15K since it came to Tulsa in 2013. Atlanta and Impala both have two runners entered; they each need one more to field a complete team. GVH has no one entered and it is a longer distance than many GVH runners like. No doubt GVH will make every effort to send a team. 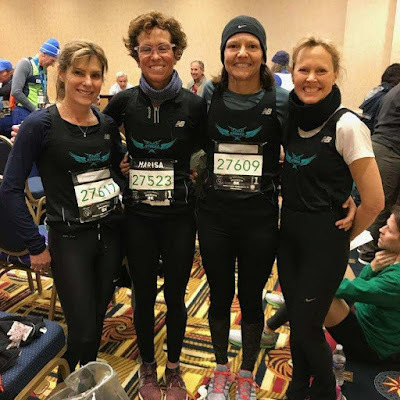 The Athena Track Club has this division locked up with a perfect 500 points from wins in the 5K, 8K and 10K road races and XC Nationals and the 5 Km XC. GVH and Atlanta are only ten points apart in the battle for 2nd place at 400 and 390 respectively. No other team can catch these three. To stay in 2nd, GVH would have to send a team and that team would have to prevent Atlanta from beating them in Tulsa. Atlanta has an advantage though; their lowest counting score is 60 whereas GVH’s lowest score is 70. So if they even tied GVH for 2nd place, they would split the points and get 85 each, but that would raise GVH’s total by only 15 points while it would raise Atlanta’s by 25 points. That would lead to a tie for 2nd in the GP with the teams splitting the prize. The same argument works for a tie for 3rd, but not for a lower place. As long as Atlanta finishes 4th or better, GVH must beat them in Tulsa to retain 2nd place in the GP. The Impala Racing Team has already entered a complete team and will be looking to pick up at least the 50 points they would need to move ahead of the Checkers Athletic Club into 4th place. Atlanta has already entered a complete team. Will GVH send a team? Another intriguing question in this division is whether the two runners that Athena has entered will run for 50+ or drop down to help the 40+ team. 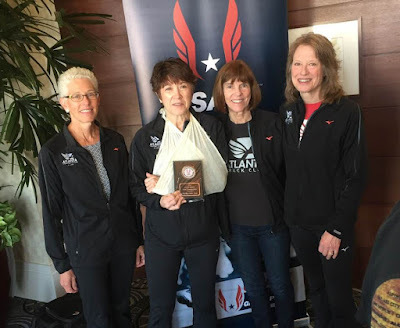 The 40+ team of Athena is not in contention for the Club Grand Prix but having just missed the National Championship in the 5K, they might think having a 15K National Championship would be a nice way for the 40+ team to end the season and look forward to the coming year. The top 3 teams in this division are the Atlanta Track Club, the Genesee Valley Harriers and the Team Red Lizard, with 470, 440, and 390 points. No other team can get close. Red Lizard has a complete team entered in the 15K; they look to defend their Championship from last year. There is a strong likelihood they will win regardless of whether Atlanta and GVH contest it or not. The 15K is a distance more to their liking than the other teams and, except for a hiccup at the 10K when one of their top runners had an off day, Red Lizard has prevailed against the other two teams this year. They would also win the GP title should neither Atlanta nor GVH contest the outcome. Atlanta has entered one of their 60+ team members but she is currently listed for the 40+ team. That suggests they are not planning on entering a 60+ team. But that runner could be switched on the last day for team declarations should two or more of their other 60+ runners elect to enter, so it is not certain. 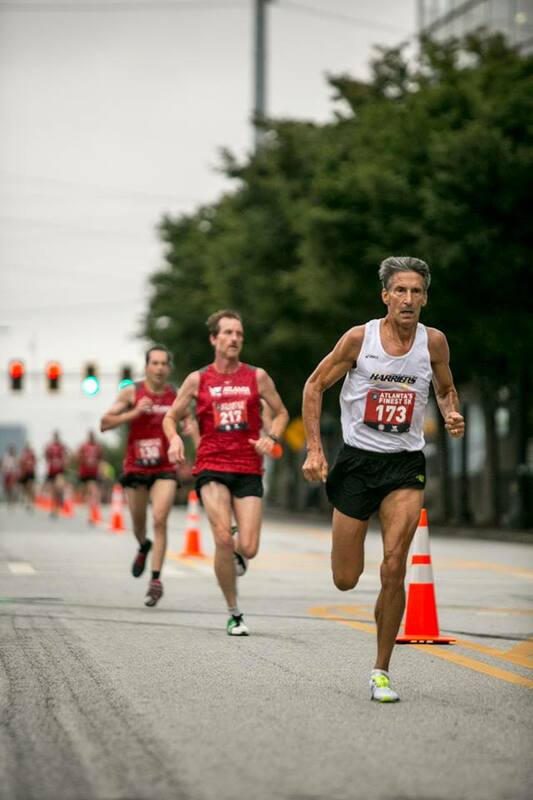 Atlanta’s 60+ team has not contested the 15K before this year. GVH competed in Tulsa in 2014 but not since. 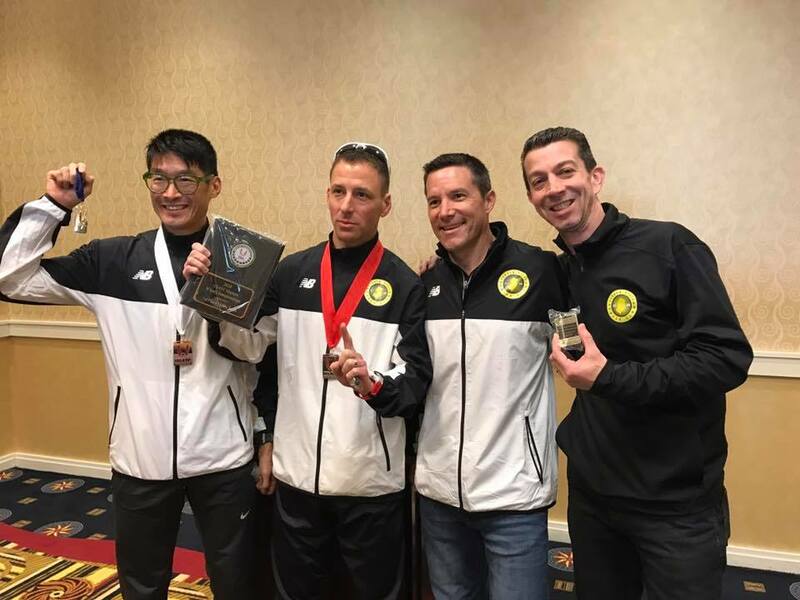 Neither Atlanta nor GVH would willingly cede this title to Red Lizard or to their other rival, but resources are limited, and runners cannot always make it to races, especially when it involves substantial travel. This is a tough one to figure out. For now I will list the current order under the assumption Atlanta and GVH will find a way to field teams for the 15K. For the first year since 2014 we have a traveling Women’s 70+ team. In 2014, the Women’s 70+ team of Playmakers Elite New Balance competed in 5 events and took home the GP title. This year the Atlanta W70+ team has competed not only in their home state but also at the 1 Mile and the 5 Km XC. That gives them 300 points and the GP title, even if they do not contest the 15K Championship. No other team will compete this year in the minimum three events required for an award. 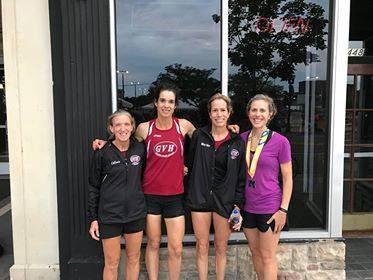 The Grand Prix contest adds a little spice and a few wrinkles to the Masters 15K Championship in Tulsa. Next I will look at how it fits in with the Individual Grand Prix contests. And then it will be time for the Race Preview for the 15K.